As a result of a low overall shooting percentage we suffered a hurtful loss against Olympiacos in Euroleague. Pavlopoulou got the game going with a quick double for the home side, to which Thomas added three more. After that Amanda managed to hit one from downtown for our first basket in the game (2nd minute 5-3). Lykendra Johnson scored three consecutive points, before Aleks made a lay-up. Unfortunately, Jessica Thomas was the next to score, forcing our first time-out in the game (6th minute 10-5). After the short pause Amanda made three free throws to get us back in the game, and then came up with a steal that led to a three by Queralt at the other end, finally giving us the lead (10-11). As a response Olympiacos came up with a 6-0 run, which was put an end to by Queralt's free throw, to which she also added a lay-up at the buzzer (10th minute 16-14). Aleks opened the second period with a triple regaining the lead for our team. Later on, Queralt added a double from mid-range, forcing the first time-out for the home side (12th minute 16-19). For Olympiacos Stamolamprou came up with a three-point play to tie the game up. Tina got us on the front foot again with two successful shots from the line, to which Thomas answered back with a lay-up. In the next few minutes neither side was able to come up with a run to pull away from their rivals, the teams were progressing head-to-head (15th minute 23-23). Yvonne broke a four-minute scoring drought by making both shots from the line also ending a 5-0 run by the Greek, which turned out to be the last points in the half (20th minute 28-25). Aleks made one of two from the line to start the second half. Next, Thomas made a lay-up, to which Amanda answered back with a mid-range double. Sotiriou hit a huge buzzer-beating triple, and Amanda's try came off the rim at the other end (33-28). Spyrydopoulou also buried a double fo Olympiacos, before Yvonne drew an unsportsmanlike foul on the hosts. She made both free throws awarded, but we missed the attempt off the possession afterwards (25th minute 35-30). Following a couple of unsuccessful attempts on both sides, Roberto Iniguez decided that he needed to talk it over with his team. The talk proved ineffective, Olympiacos scored three times in a row for the biggest lead in the game (28th minute 41-30). A minute later we were still unable to score, and Mazic also came up with a three-point play to widen the gap between the two sides, time-out Sopron (44-30). After the short pause Yvonne converted two free throws, to which Zs�fi added two more points from mid-range. Stamolamprou came up with a triple for Olympiacos, Candice, converted two free throws, and then Stamolamprou had the last laugh in the quarter with another big three to beat the buzzer (30th minute 50-36). 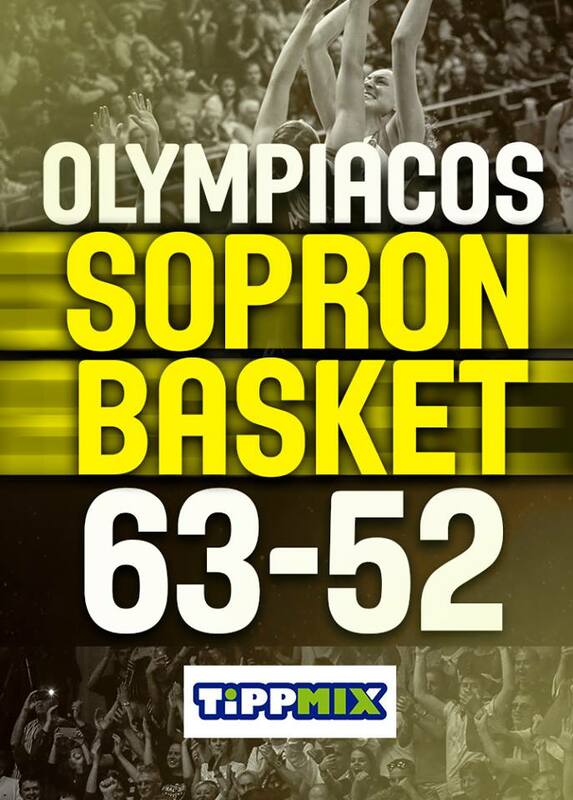 After two minutes of silence Spyridopoulou buried a mid-range double to get the final stage of the game going, to which Zs�fi answered back with a triple (33rd minute 52-39). Johnson beat Amanda one-on-one for a lay-up, and after a time-out by Roberto Iniguez Olympiacos came up with another triple, to which Candice answered back with a double, and when Queralt made a lay-up after a steal it was the Greeks' turn to call their team to the bench (35th minute 57-43). Johnson and Yvonne exchanged baskets, and then Thomas and Candice did the same. In the last minutes our only goal was to make the difference as small as possible, and we managed to crawl a little closer to the hosts, but despite all that Olympiacos have got their first Euroleague win against us (40th minute 63-52). Roberto Iniguez: Olympiacos deserved to win, because they were better than us in every aspect of the game from the first until the last second. They played bravely, and proudly! Euroleague is the strongest series in the world, in which if you don't have your head in the game completely, then you will have to count on many problems coming your way. We played our worst game against Carolo in the first round, just like today's loss it hit us very hard, but we have to recover! This is a great team that had similar problems to deal with last season as well, but managed to solve them. We have to stay together, our goals haven't changed, we will keep working individually, and as a team. This is life, this is basketball. Congratulations to Olympiacos once again, they played very well! Aleksandra Crvendakic: Energy was missing from our game today. We missed plenty of shots, and had many problems during the game. Congratulations to Olympiacos, they played very well today. We'll have to recover and keep doing the work we believe in! FINAL4 – Indulhat a j�t�k!